I was so excited to finally go on the Alaskan cruise, but ended up disappointed in the overall experience. The staff in the restaurants were grumpy and the food was mediocre. The mini-suite was very small and there was barely any closet or drawer space. However, the Norwegian Bliss is a beautiful ship and the entertainment on board was great. We didn’t get to the glacier because of a medical emergency on board. I understand, but it is also the reason most people go on the cruise and the line should have made better arrangements to get seriously ill off the ship. It was a beautiful day and calm day so weather was not an issue. The salmon fishing excursion in Kethickan was outrageously expensive. Our boat got 3 keepers but some of the boats didn’t catch any. The best excursion was to Mendanhall Glacier and whale watching, well worth the money. The White Pass train was also a fun experience and the scenery was breathtaking. There was way too much wasted time at sea and stopping at British Columbia at 4:00 pm and departing at 10:00 pm was a complete waste of time. Overall, the Alaskan cruise departing from Seattle on the Norwegian Bliss was disappointing to mediocre at best. I was so excited to finally go on the Alaskan cruise, but ended up disappointed in the overall experience. The staff in the restaurants were grumpy and the food was mediocre. The mini-suite was very small and there was barely any closet or drawer space. However, the Norwegian Bliss is a beautiful ship and the entertainment on board was great. 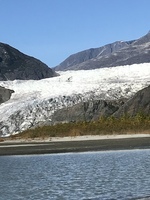 We didn’t get to the glacier because of a medical emergency on board. I understand, but it is also the reason most people go on the cruise and the line should have made better arrangements to get seriously ill off the ship. It was a beautiful day and calm day so weather was not an issue. The salmon fishing excursion in Kethickan was outrageously expensive. Our boat got 3 keepers but some of the boats didn’t catch any. The best excursion was to Mendanhall Glacier and whale watching, well worth the money. The White Pass train was also a fun experience and the scenery was breathtaking. There was way too much wasted time at sea and stopping at British Columbia at 4:00 pm and departing at 10:00 pm was a complete waste of time. 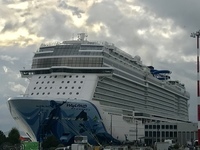 Overall, the Alaskan cruise departing from Seattle on the Norwegian Bliss was disappointing to mediocre at best.